The 1975 Tyrrell 007 was Derek Gardner’s direct development of the 1974 car which had already won a couple of Grands Prix and was improving as the season progressed. The cars now carried extended rear side pods, angled to accommodate the semi in-line angled water radiators which nearly reached the rear wheels (experiments during practice sessions near the end of 1974 having proved beneficial). The upgraded 1975 variation won at Kyalami (Scheckter), but was otherwise surprisingly less successful than in 1974. The airbox was of a type that enclosed a slimmer modified roll-over bar and the rear wing mounting was altered to a double support, rather than the single pylon structure on the 1974 car. Detail changes elsewhere could be sited, however the car was still essentially an 007, albeit it had lost its torsion bar springing, now relying on more conventional coil-spring over damper units (inboard front operated by the same bell-crank push rods and outboard rear). 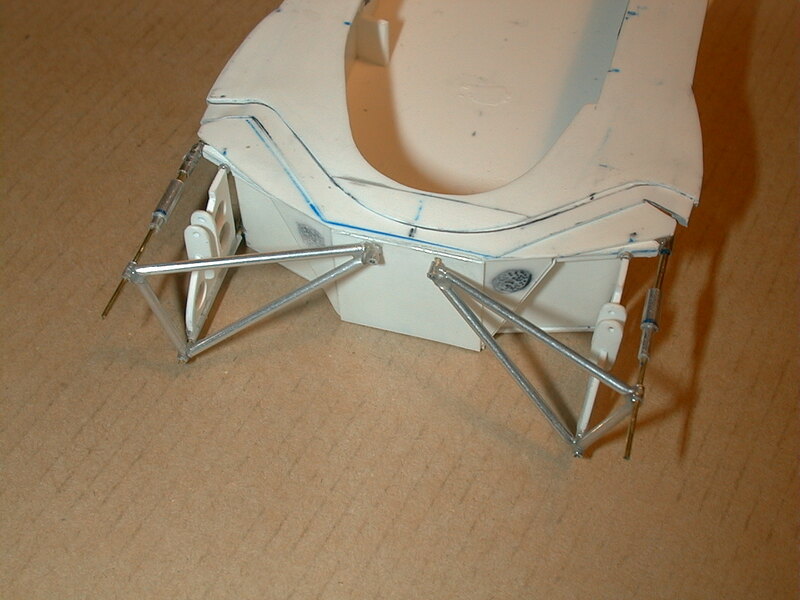 Additionally, front braking was now outboard. In its final stage of development, the rear half of the car was carried-over to the 1976 season, Formula One’s best kept secret having been the six-wheeler, project P34. Indeed, the rear half of an 007 was grafted on to the new P34 front chassis during testing of the new four 10 inch front wheel units. This was all about reducing lift and drag and increasing contact patch area for steering and braking, requiring intense collaboration with a team at Goodyear producing special tyres for the new car. The image of the 1975 007 with a 1974 airbox represents a hybrid that never raced. The 1975 car when first raced at Kyalami by Scheckter, had the new airbox and rollover bar. The model was made between November 2000 and summer 2004 when I met Jody Scheckter unexpectedly in the workshop whilst working with his 1975 Tyrrell 007, in for a repair/restoration of wiring damaged by mice as I recall. An account of this meeting is described on page 35 of my first book ‘The First Twenty Years’ and includes my fortunate on-the-spot ability to take the initiative, along with Jody’s gracious accepting of my work in making a 1/12 scale model of his car. This access to 007 was facilitated by Kerry Adams who allowed me in his workshop whenever I wished. (This led to me seeing and repairing Jody’s own model of a 1974 Tyrrell 007 which had been made in America and since damaged. I was intrigued when he told me about it, as I knew of no 1/12 scale model of this car. When asked to examine it and assess it for repair, it became obvious it was a clever modification of a Tamiya McLaren M23, naturally without an airbox, one of the signature elements of that car. 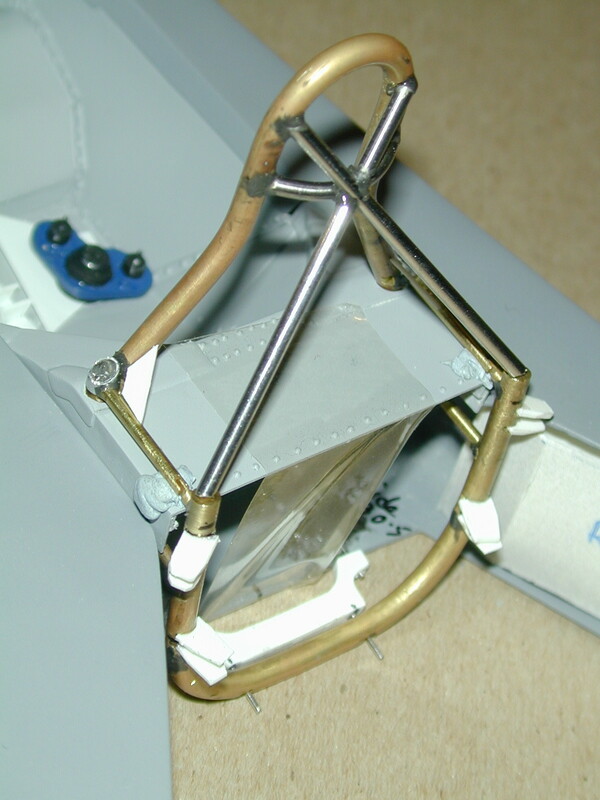 It was in late 2004 that I made a couple of 1974 007 airboxes and presented Jody with one in January 2005). 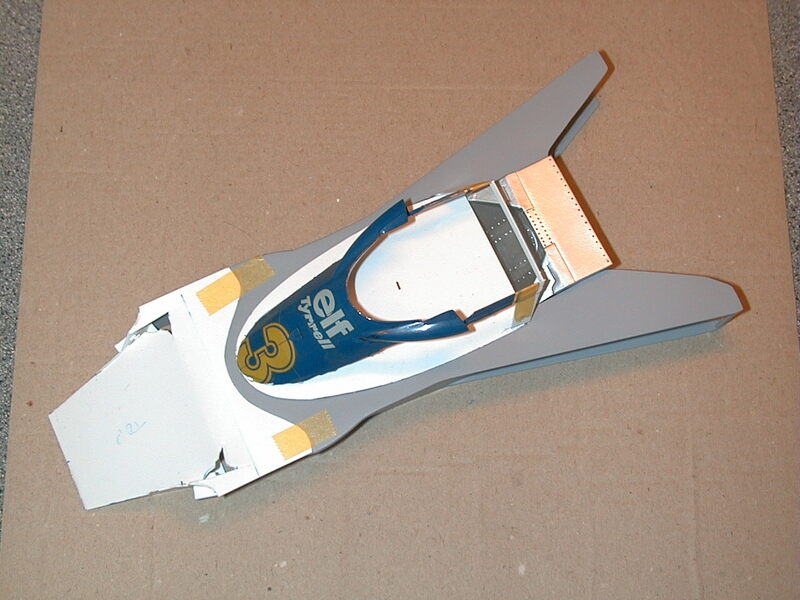 As in the 1974 car, I have only made an inner and outer monocoque and nose cone so far, however once these are completed, the rest follows more easily. The engine can straightforwardly be super detailed, suspension items made and the whole car brought together. 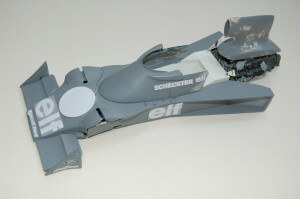 When I researched and commissioned white decals for the Tyrrell 006 (completed in 2012), I also researched exactly what was needed for the 001, 002, 003 and 007 cars and in that way should be able to decal them in an ideal way under lacquer, as per the 1973 006. To superficial inspection, the monocoque looks angular and straightforward, however there are a surprising number of distinctive nuances the most detailed being around the forward lateral aspects of the monocoque and front suspension pick-up points on the monocoque. Getting the engine mounts and rear bulkhead right is critical, as is the detailed arrangements of the inner monocoque with its unusual forward round apertured top panel, not to mention the very characteristic front suspension forward pick-ups on the front bulkhead, very much Derek Gardner and not seen on any other car but an 007. 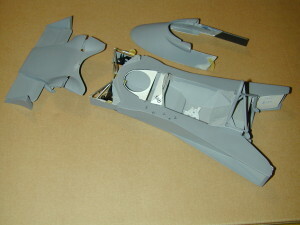 In recent years, Model Factory Hiro has produced a 1/12 scale transkit for the 1975 Tyrrell 007 utilising a Tamiya P34 kit. Unfortunately, their execution of certain signature appearances of the bodywork especially, leave me unconcerned about producing my own models as first planned. 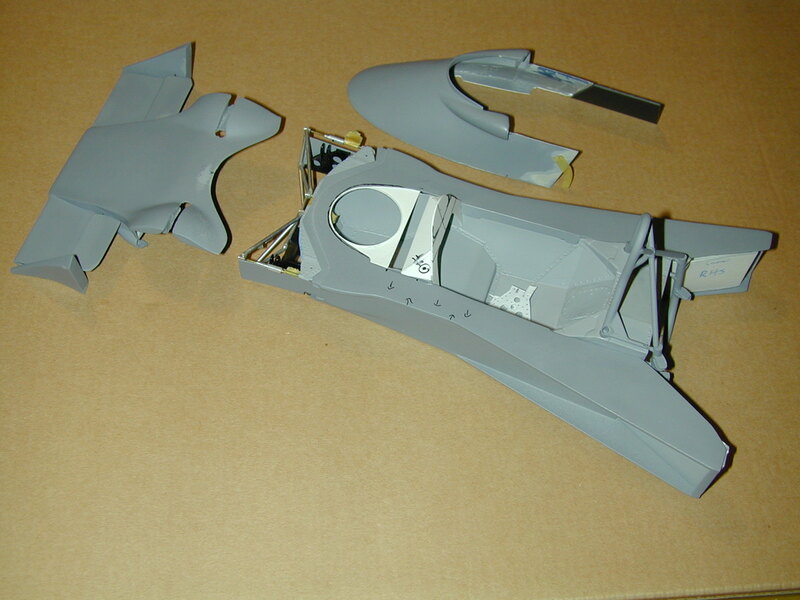 However, if one had nothing else to go on, these MFH kits and this one in particular, are a great place to start. Some MFH kits are wonderful, this one could be better. 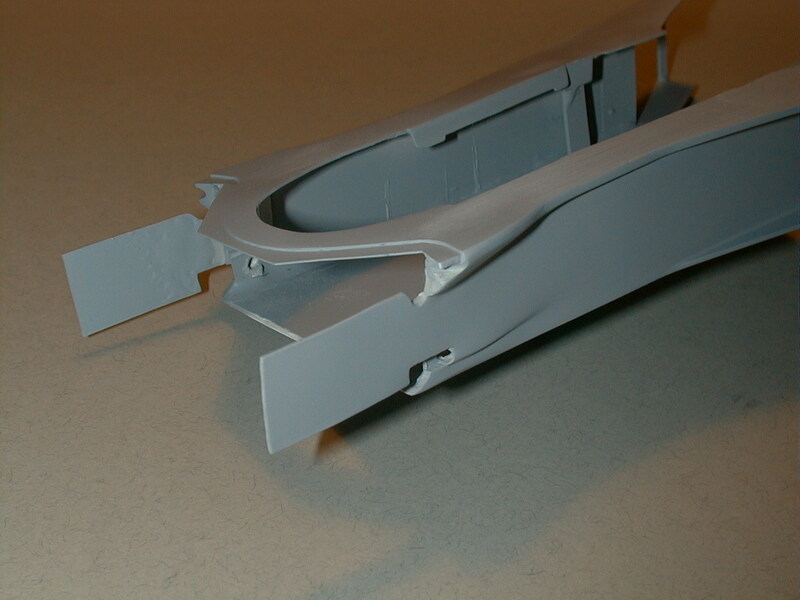 The monocoques of both the 1974 and 1975 cars are finished in grey primer and I am looking forward to the opportunity to complete all the other items and make each car a fitting tribute to Derek Gardner, Patrick Depailler and Jody Scheckter.